While there's no word of a finished Fleet Foxes album, they did manage to wrap up a project in the past few days. Their new website is live, and features a wealth of studio photos and even a small documentary about Robin's solo swing with Joanna Newsom. I haven't watched it, in fear of accidentally hearing some of her music. One of my deep, shameful secrets is that I'd never heard the Drive-By Truckers' first two albums, Gangstabilly and Pizza Deliverance. My goal is to right that this month; I've already been listening to Pizza Deliverance and I plan to dive into Gangstabilly in the next few weeks. I'm surprised by how many of the songs I've heard before. The new Arcade Fire album, The Suburbs, is unbelievably good. Shame on Pitchfork for awarding it a measly 8.6. Thanks to my excellent girlfriend jumping on the sale, we scored front row center tickets to the Avett Brothers' October performance at the South Carolina State Fair in Columbia. 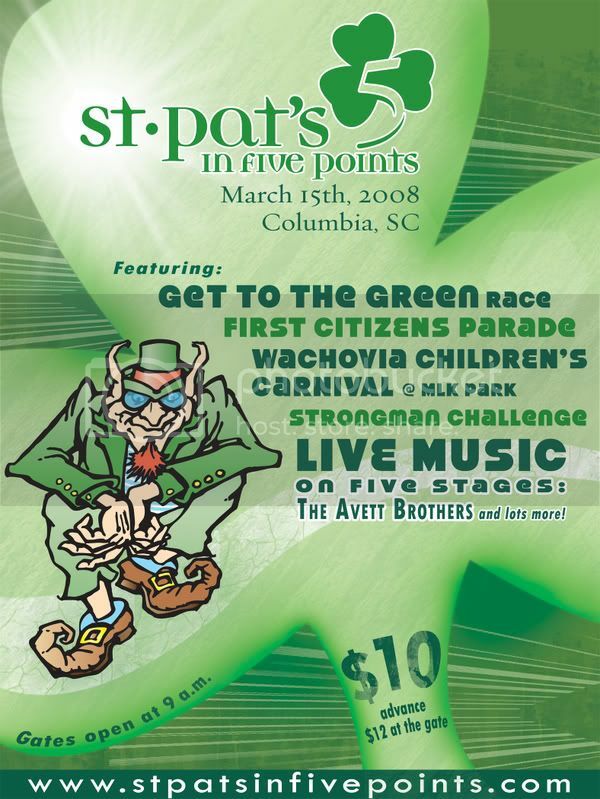 Their last performance in Columbia was sometime before March 2008, which is when they were supposed to headline the St. Pat's in Five Points celebration. A massive storm cancelled their performance. Regardless, I had the pleasure of designing the festival poster. Right after I wrote that Tube Amp about Neko Case's outburst, she announced a show in Charleston, which will happen on August 16th. I will bring hundreds of CDs for projectile use, because I think she's bluffing. I listened to Crazy For You, the debut album by Cali surf-rock outfit Best Coast, and I wasn't as moved as all these shining reviews suggest I might have been. Bethany Cosentino is an excellent singer--sort of a poor man's Neko--and she has a knack for crafting hooks. But her lyrics are abysmal, and her music doesn't brim with pathos the way, say, Girls does. It'd take a misanthropic soul to truly hate the harmless little record, but I doubt I'll spend much time with it this year.